TSPSC has conducted written Examination for the PET, School Librarian and Staff Nurse Notifications16/2017, 20/2017, 21/2017 on 17-09-2017 and 18-09-2017. The Final keys of these examinations will be avialable on commissions website tspsc.gov.in from 22-11-2017. No firther objections will be entertained on final keys. TSPSC has conducted Written Examination for the above notifications on 17/09/2017 & 18/09/2017. The Preliminary Keys of these exams will be available on TSPSC website from 04/10/2017. 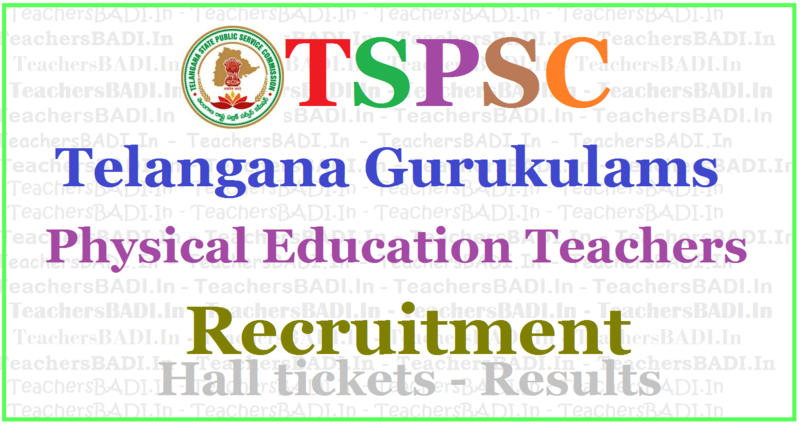 The objections on the Preliminary Keys will be accepted online on TSPSC website from 05/10/2017 to 10/10/2017. Candidates are advised to note the above dates and submit their objections through the link provided. Objections received beyond 10/10/2017 will not be considered. The candidates are instructed to submit their objections only in English and only as per the order of questions appearing on the screen against the question numbers allotted by TSPSC. Board of Intermediate Education, Telangana with at least 50% marks. 2 Physical Education Teachers in Telangana Social Welfare Residential Educational Institutions Societies. 3 Physical Education Teachers in Mahatama Jothiba Phule Telangana Backward Classes Welfare Residential Educational Institutions Societies. 4 Physical Education Teachers in Telangana Minorities Welfare Residential Educational Institutions Societies. 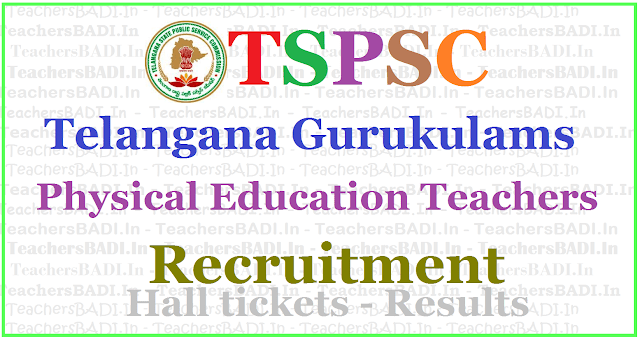 5 Physical Education Teachers in Telangana Residential Educational Institutions Societies. AGE: Minimum 18 years & Maximum 44* years. The age is reckoned as on 01/07/2017 (Rule- 12(1)(a)(v) of State and Subordinate Service Rules). *As per G.O. Ms. No. 329 GA(Ser.A) Dept., Dt. 27/07/2015 read with G.O. Ms. No. 264 GA(Ser.A) Dept.,Dated: 26-07-2016, the upper age limit is raised up to 10 years. N.B. : 1) No person shall be eligible if he/she is less than 18 years of age. 2) No person shall be eligible if he/she crossed 58 years of age (Superannuation age).
) Mode of Payment of Fee:The Fee mentioned at Para-I(6)(a) is to be paid online through SBI ePay duly following online instructions once the application form details are submitted by filling TSPSC ID, date of birth and other particulars. The fee once remitted, shall not be refunded or adjusted under any circumstances. Failure to pay the examination fee, application fee, wherever applicable will entail total rejection of application. The list of Banks providing service for the purpose of online remittance of fee is given in ANNEXURE – II. 1. a) Those candidates who qualify in the Examination in order of merit will be called for 1:2 ratio for verification of Certificates, Community and Category wise for the vacancies available. The minimum qualifying marks for Selection are OCs 40%, BCs 35% SCs, STs and PHs 30%. The minimum qualifying marks are relaxable in the case of SC/ST/BC/PH at the discretion of the Commission. 2. The candidates will be selected and allotted to the Residential Educational Institutions Societies in Telangana State as per their rank in the merit list and as per zonal preference for allotment of candidates against vacancies and for the vacancies available. 3. The appearance in all papers at the Written Examination as per rules is compulsory. Absence will automatically render his candidature as disqualified. 4. Candidates have to produce Original documents and other particulars on the day of verification itself. If candidate fails to produce any of the required certificates and if the particulars furnished by him / her in the Application do not tally with the Original documents produced him / her, then his / her candidature will be rejected/disqualified without any further correspondence. As candidature for the recruitment is processed through Computer/Electronic devices based on the particulars furnished in the Application Form, the candidate is advised to fill in all the relevant particulars carefully. 5. While the Commission calls for preference of candidates in respect of posts/R.E.I. Societies etc., in the application form, it is hereby clarified that the said preferences are only indicative for being considered to the extent possible but not binding or limiting the Commission’s powers enjoyed under Article 315 and 320 of the Constitution of India. Therefore, the Commission has the power to assigning a successful candidate to any of the notified posts for which he is considered by them to be qualified and eligible, subject to fulfilling the selection criterion. Eligible candidates may apply through online mode only from 20-04-2017 to 09-05-2017. Hall ticket Download for Notification no:16/2017 PHYSICAL EDUCATION TEACHER in Residential Educational Institution Societies (GENERAL RECRUITMENT) .